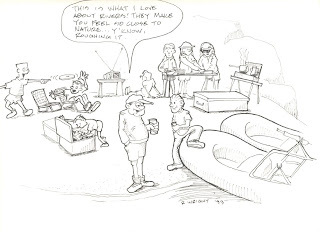 This one is another from my archive of old whitewater toons. I had just completed one half of the run on the Selway River, a very exciting run at regular water levels, and extremely exciting at high runs. The water level came up to flood stage while we were on it, so we aborted the trip. How that story relates to this toon is this: the rafts that were supporting us in the kayaks were laden with EVERY gimic camping item you could think of. The whole kitchen was in a dry box where you screwed in the legs, tipped it up, and opened it up, and voila!!! your dinner was practically already cooked! Every single kitchen utensil was there. Well, that was wonderful until we had to abort the trip, break down all the rafts and gear, and haul everything up a steep trail to the only landing strip in the canyon, so the forest service could call in an airplane to haul all the stuff out. It took us (I think there were about 12 of us) until mid-afternoon to lug everything up that trail. Back breaking stuff!! It took 4 airplane trips to haul it all out of the canyon! Then, of course, I added insult to injury, and chose to hike out along the river to the take out to get the cars. That was a two day, class 5 hike!! So, getting back to the toon, after that trip, I found that there are a lot of rafters who love to get the latest river camping stuff. Just check out any raft supply catalog. It is incredible what they have in those things!! I equate that kind of river-camping to motorhome camping!! I mean, these people take EVERYTHING with them; beds, mattresses, multi-room tents, lanterns, dishwashers, laundry facilities, micro-waves...everything!! That is what inspired this toon. I think my tendency is to become a minimalist!! But wait- aren't you a rafter now, too?